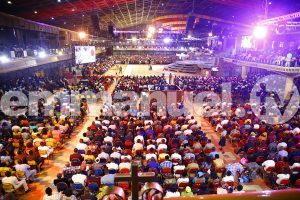 The presence and power of God was evident and obvious at The SCOAN Service on Sunday, touching and transforming the hearts and lives of countless people who had tuned in to the Live broadcast as well as those who were physically present. In an impacting and life-changing message titled THE SECRET OF TRUE BELIEVERS, using James 1:1-4 as his proof text, the man of God explained, “Life is about both sides – positive and negative. As a believer, we may have challenges but our challenges are not like others. Our challenges are to improve us, not to impair us. Our challenges are to strengthen our desire and determination for God”. Encouraging all on the need remain calm in their challenges, he said, “You don’t do the right thing in a panic mood. You must take control of your situation instead of being afraid because satan himself, the cause of crisis and challenges, has been defeated”. He expounded, “We need to dwell on this issue of challenges because many abandon their faith because of challenges. However, these challenges force us to look deeper, explore possibilities, increase our desire and determination for God, pray and dream of other ways that might have been ignored”. Distinguishing between those who merely claim to be believers and those who are true believers, he said, “True believers greet adversity as a friend, greet challenges as friends”. Stressing on the need as Christians to “count it all joy” in our trying situations, he stated that without being tested, as a true believer, our genuineness cannot be determined. Christine Liswaniso from Namibia experienced stagnation in her career and academic failure for over 6 years. Each time she applied for a promotion at her workplace, it seemed like she was facing a brick wall. Nothing she laid her hands on seemed to progress. She failed her Master’s Degree a couple of times and life seemed to be at a standstill. A friend heard of her predicament and, touched by her story, gave her the New Morning Water. Christine ministered it in the name of Jesus Christ and all the closed doors in her life began to open! The promotion that she had been looking for, for over six years was achieved instantly and she went up to the level of grade six in her profession. After failing to complete her Master’s Degree in philosophy multiple times, she decided to try one more time after ministering the New Morning Water. She sat for the exam and to God be the glory, she passed and became a graduate with a Master’s Degree in Philosophy. After achieving the Master’s Degree, she was again promoted to grade five where she received a major financial breakthrough. She thanked God for intervening in her situation and advised people to run to God to receive His mercy for by doing so, they would receive their own breakthrough testimony. DELIVERED FROM THE MARINE KINGDOM! Severely battered by an evil spirit that had possessed her since the period of her sojourn in her mother’s womb, Mercy’s life became nothing but a trail of calamity. It all started the day her mother, who had been overdue with her for eleven months, was taken to the riverside by a spiritualist. As directed, she tiptoed inside the water to have a quick spiritual bath, envisaging that that would unravel the mystery surrounding the foetus that was supposedly tied in her womb. However, as the minutes ticked and nothing seemed to change, following her adventure trip to the spiritualist, she had to succumb to her doctor’s verdict that only a surgical operation could get the foetus out of her womb. As little Mercy grew up, it dawned on her mum that something was greatly amiss. She just could not comprehend the mischievous traits that had engulfed Mercy’s life. She became unruly, clubbing, partying and dating different men which had an adverse effect on her academics as an undergraduate student. Her grades dropped and most times, she bribed examiners to wangle her way through. Having a double existence, she spent the better part of the night in a different habitat under the water where she had struck a deal with the marine spirit to go into the world and destroy men with the evil powers she had been given on her eyes and private parts. According to Mercy, any man she had an affair with would end up in total destruction, including his marriage. She also possessed powers to initiate young ladies into the marine kingdom through bangles which she would give them to wear. Expatiating further on this, she said once they wore the bangle, in their sleep that night, they would find themselves in the marine kingdom where they would be initiated and given evil powers to go into the world to destroy men. 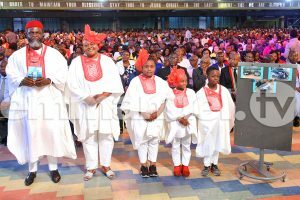 Seeing herself heading for total destruction, she heeded the advice of a friend to come to The SCOAN where she received her deliverance. “She is my princess. I entered her when I mother was pregnant of her”, the evil spirit cried as Prophet T.B. Joshua prayed for Mercy, in Jesus’ name. As the man of God continued to pray for Mercy, she fell and the marine spirit that had wreaked havoc in her life was cast out! Her mother, Mrs Ajongbolo, testified of the miraculous change in Mercy’s life since her deliverance. “She is no longer the rude girl I knew her to be. she is now very calm”. 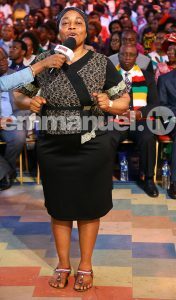 Mercy also testified of the changes she has experienced ever since her deliverance – she no longer sees herself in the evil kingdom, no more nightmares, all the evil powers are gone. To God be the Glory! As a young single mother of three kids, Bubemi opted for the job of prostitution as a way out of her predicament. “I decided to go clubbing to forget my worries. At the club, I met people I had never mixed with before”, she said. “Men would come and take me out and I would get money for sleeping with them. I began to drink alcohol and smoke. When I slept, I would have nightmares, seeing crocodiles and short demons threatening me and saying I would not get out. When I would wake up, I would have pain all over my body”, she added. 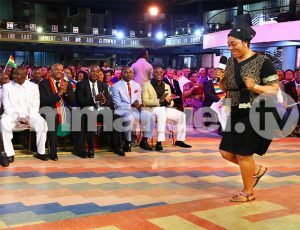 After explaining her plight to a stranger who cared enough to ask about her welfare, Bubemi was brought to The SCOAN for prayers. During the Mass Prayer, a prophetic message came that marked the turning point in Bubemi’s life. Prophet T.B. Joshua prophesied about a prostitute in the auditorium wearing a wig with different colours. Out came Bubemi, exactly as described. After her confession, Bubemi received prayers and today she shares the story of how her life has been transformed after God located her case through prophecy. 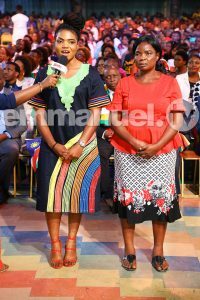 Bubemi’s Mother could not hold back her tears as she sighted her daughter for the first time in five years, on Emmanuel TV, being called out through prophecy. According to her, she was oblivious to Bubemi’s activities as a prostitute but was grateful that God had put an end to her daughter’s life of prostitution. In her advice, Bubemi said, “Don’t allow your situation to take you away. Stick to God, He is the only One who gives peace”. Mrs Belinda Sevidzem’s life was characterized by severe pains and discomfort and as all effort to ease her suffering proved abortive, she had no choice than to come to terms with her lot in life. The 47-year-old Cameroonian had been battling with severe back pains which culminated in difficulty in walking for a long period of time, having adverse effects on her social life. The lumbar corset and knee supports provided by healthcare professionals seemed to offer little help to alleviate her condition. However, a visit to The SCOAN was a light to her dark tunnel. As Prophet T.B. Joshua prayed for her, in Jesus’ name, the evil spirit her health crisis began to manifest. Belinda explained that the next thing she could recall was that she found herself on the ground. “I was light and happy when I stood up. I had joy in me”. 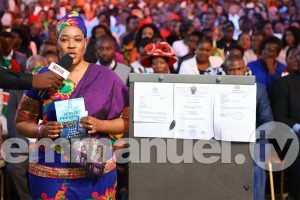 Testifying of the radical transformation that had taken place in her life, Mrs Sevidzem happily declared, “Before, I was unhappy and had pains but from that day, I have been a happy woman. I am now able to walk! I am no longer an object in the house. I am a woman and a mother to my children”. She said that previously, she used to have bad dream, seeing dead people and snakes in her dreams. However, since her deliverance, she sleeps like a baby. She advised all to put their trust in God. The life-experience you are about to read is a chilling expose of the kingdom of darkness and its sinister operations in this world, as told by one who was once an embodiment of diabolical powers, one who even bore the name ‘son of darkness’. Nicholas Egwuche was born and brought up by a “demonic goddess” underneath a notorious river in Kogi State, Nigeria. In the ‘mansion under the sea’, he was schooled in every manner of dark art imaginable by the woman he assumed to be his ‘mother’. In reality, his biological mother, who was just sixteen years old at the time she conceived, had harrowingly ‘sacrificed’ him to that goddess to save her the shame of an early pregnancy. Nicholas’ first sojourn in the ‘real world’ came when the demonic enchantress instructed him to find a young virgin girl and bring her to ‘their kingdom’ for a sacrifice. He was only thirteen years old. Blood was drunk as part of the satanic ritual which imbued the young man with unnerving boldness, knowing that no weapon could “penetrate him”. Not only was he proficient in the creation of charms, he was equally tutored in the art of shooting and could handle any form of advanced weaponry. Nicholas was instructed to seek those who had “a bright future” and ensure their focus was diverted from God’s ways to that of the devil’s. He had warped the minds of many would-be Gospel singers, plunging them down a path of secular music instead. The demonic authority he possessed gave him strange abilities, such as the power to disappear and pass through walls. Attending university in the physical world, the school became his hunting ground – to initiate victims either unto ritual sacrifice or satanic servitude. However, one day he learned the shocking truth behind his birth through his mother who came to confront the goddess and demand his return. She (the goddess) killed his own mother before his eyes, demanding that he lay with her corpse for several weeks thereafter for further spiritual fortification. With this numbing reality, Nicholas chose to break free from the clutches of the ‘goddess’ and use his powers for his own purposes. As he struggled to leave, she placed a vicious curse on him – that he would be a condemned thief for the rest of his life. Several years later, Nicholas had been in over six prisons – once for a period of two years. Despite his uncanny abilities, he was always caught at the point of crime, disgraced and thrown into jail. There, his ‘spiritual mother’ would mock him before eventually setting him free and then throwing him back into incarceration again. In his last imprisonment, she spiritually communicated to him a mission he was to undertake to secure freedom – the destruction of a particular police officer whose actions were causing problems to their kingdom. 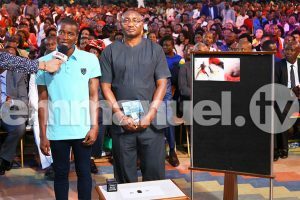 When called to see the police officer – who happened to be an Emmanuel TV Partner and regular visitor to The SCOAN – CSP Mashat instantly brought forth the New Morning Water and began ministering it to him. Nicholas felt “fire” burning throughout his body and began to vomit out the strange powers within him in the form of two rings and a razor. Shocked at what had just transpired, CSP Danladi knew this case was far from ordinary and decided to bring the young man to The SCOAN for complete deliverance. Last week, Prophet T.B. Joshua prophesied concerning his case and prayed for him in the power of the Holy Spirit! 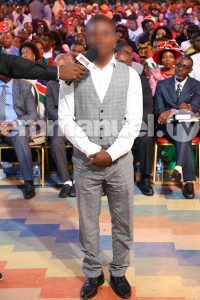 Ever since entering The SCOAN, the spiritual connection with the female goddess has been severed, Nicholas’ addiction to drugs and alcohol broken and all demonic powers he once possessed conquered. 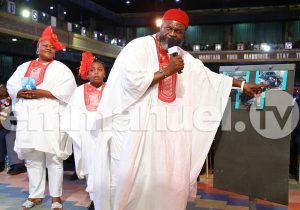 Chief Okpalakunne was seated in the church auditorium during a SCOAN Sunday Service when Prophet T.B. Joshua walked up to him and gave him words of prophecy: “Your home is scattered. You are the cause of all this”, the man of God said. Chief Okpalakunne confirmed all what the man of God said. The whole family was invited to The SCOAN for a family reconciliation. Since then, they have been singing praises to the Almighty Father for His unfailing love. Today, as they shared their testimony, one could indeed see the total transformation in their lives. “The woman you are seeing now is not the person you saw in the video; we now eat together”, Chief Okpalakunne joyfully declared after a playback of the video recording of the day of their reconciliation. Then, one could easily sense the bitterness and pain they were holding in their hearts. This, however, is now a thing of the past. 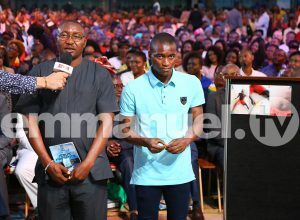 Chief Okpalakunne testified not only of the deliverance and reconciliation he and his family received but also of the financial blessing of N200,000 Naira from Prophet T.B. Joshua and the Emmanuel TV Partners which he and his wife invested in their businesses and since then, breakthrough has come to their finances. They have been able to buy cars. Mrs Okpalakunne was overjoyed as she appreciated God for the mighty thing He has done in her family. She said there is peace and happiness in the family now. She advised all that are facing one problem or the other to run to God and He would see them through. “He is a fraudster. 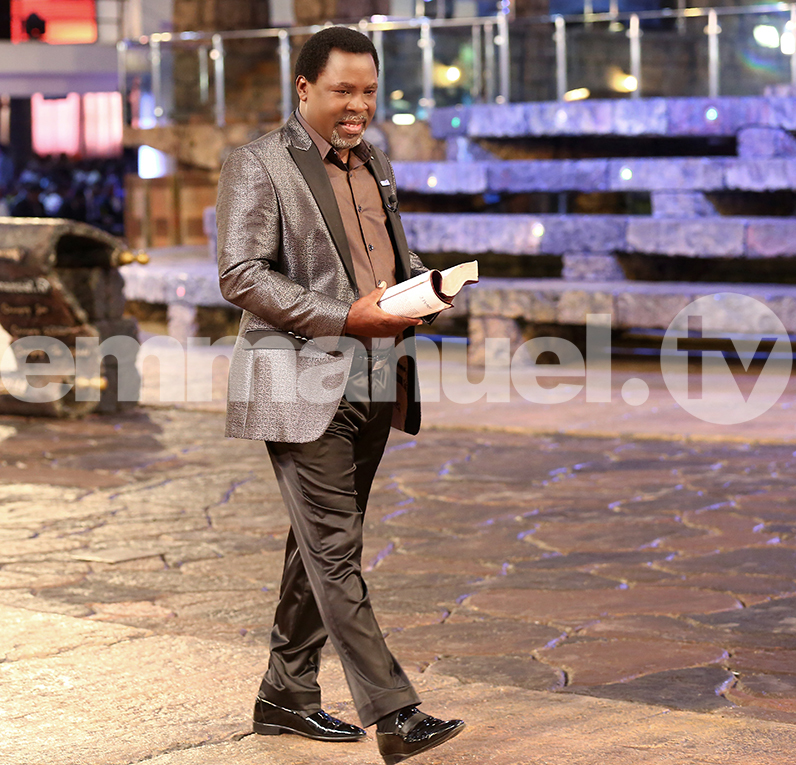 I entered him from birth”, the evil spirit in Mr Chibuzo said as it manifested during his deliverance at The SCOAN. He said that it all started when he was a little boy. Right from a young age, Chibuzo was afflicted with the spirit of stealing, even leading to the point where he was expelled from school for theft. Travelling to Lagos “in search of greener pastures”, he met a group of men who were into the dubious business of defrauding people on the internet. He joined them and became acquainted with various tactics used by the dupers. Mr Chibuzo explained that he would disguise himself as a foreign businessmen looking for relationships on Facebook and other dating sites. After luring prospective suitors – mostly elderly widows – he would start the ruse by promising to marry them. After securing their affection, he would then introduce them to a ‘lucrative business deal’ which involved them investing huge amounts of money into a foreign account. After they had started paying, he would then create a fake website and place compromising pictures of his victims on there, insisting that more money be paid to secure their removal. The money he stole through such trickery and blackmail amounted to hundreds of thousands of dollars. However, after collecting all the money, his riches were accompanied by even worse troubles. He would see the family of the people he duped fighting him in the dream – especially a lady who died from a heart attack shortly after realising she had been duped. He developed sicknesses, was spiritually tormented and found himself moving from one police station to another. After all the stress, guilt, torment and evil attacks in his dreams, he decided to come to The SCOAN. When he came, he was delivered in the name of Jesus Christ. He no longer experiences the evil attacks and torment in his dreams and now has peace. He advised the youth who may be looking for quick money that they should not go into the life of fraud, that they should seek first the Kingdom of God and His righteousness and all other things shall be added unto them.